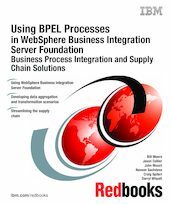 This IBM Redbooks publication examines business process integration using Business Process Choreographer to build solutions that help to streamline the supply chain process. We provide a sample scenario that integrates business processes to streamline a supply chain showing how suppliers and customers can use global repositories to synchronize data. The sample scenario discussed in this publication was initially implemented using WebSphere Application Server Enterprise Process Choreographer to aggregate and transform supplier product data. Data is then published to a global repository using the WebSphere Web Services Gateway, and also loaded to a catalog that uses a WebSphere Commerce portal. We take this existing scenario and detail how to migrate the business processes to run on WebSphere Business Integration Server Foundation V5.1. As part of this migration effort we describe how to use WebSphere Studio Application Developer Integration Edition V5.1 as the development environment for process migration. The migrated sample uses Business Process Execution Language (BPEL) processes.